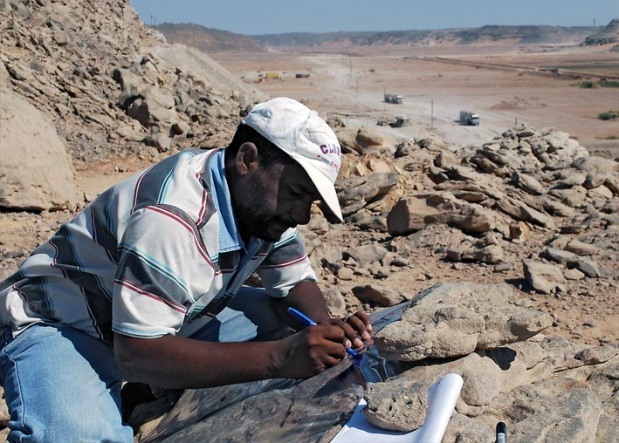 Emergency in Wadi Abu Subeira: Adel Kamel of the Supreme Council of Antiquities in Aswan recording Late Palaeolithic rock art. In the background: Heavy trucks transporting clay from the numerous mines in the wadi. The clay is used in the Egyptian ceramics industry. The rock art is comparable to the better-known occurrences at Qurta by Kom Ombo, where Dirk Huyge and his Belgian team has recently confirmed the age of this type of rock art: It is definitely belonging to the Late Palaeolithic era, and thus comparable to the great “Ice-Age” art in Europe – especially in the Late Magdalenian period. It is yet entirely unclear whether there is a relationship in terms of long-distance influence and intercultural contact, but, according to Huyge, the Egyptian occurrences clearly “introduce a new set of challenges to archaeological thought”. 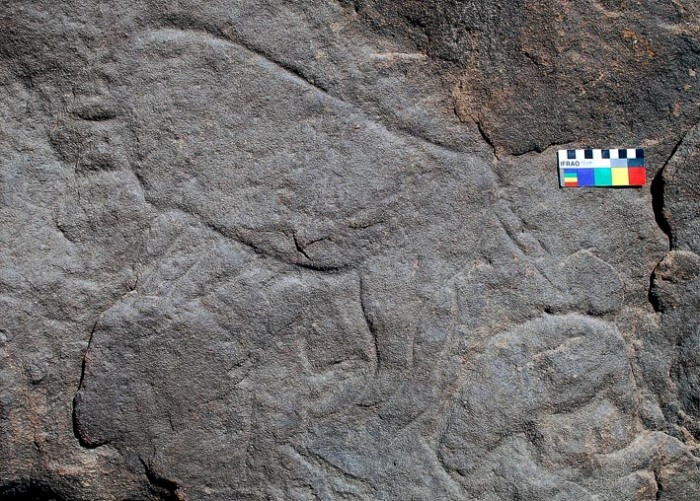 This is why it is so important to safeguard the Wadi Abu Subeira rock art and the associated archaeological sites for the future – otherwise we will lose an important place that may help us finding out whether there was in fact contact between North Africa and Europe in the Late Palaeolithic. A great gift for ancient man, hematite and ochre is the curse for Adel Kelany and his archaeological team attempting to survey and protect the rich archaeology of Wadi Abu Subeira. For there is still a big need for red pigments, and hematite and ochre can, of course, be made into steel! Lately, the iron mining in the wadi has greatly intensified, seemingly after new concessions were given to various companies by the Egyptian mining authorities (see map above). The new concessions are so extensive that they may effectively wipe out nearly all archaeology from the wadi – as if the wadi was not threatened enough from other mining activities! For, until recently, the greatest risk was related to widespread clay mining for the Egyptian ceramics industry. However, since the clay is occurring in thin layers only, most of the work was undertaken as underground mining, following these thin layers. This mode of mining caused some destruction by the mine openings, but did not wipe out everything nearby. Storemyr, P., Kelany, A., Negm, M. A., Tohami, A. (2008). More “Lascaux along the Nile”? 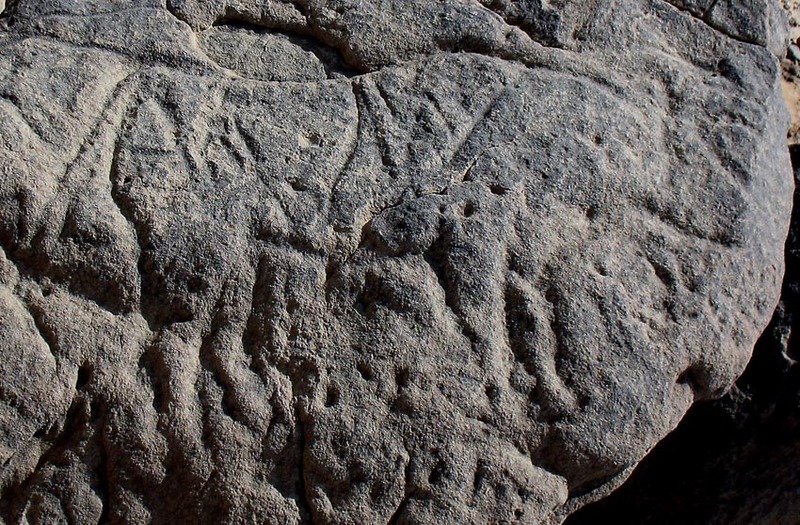 Possible Late Palaeolithic rock art in Wadi Abu Subeira, Upper Egypt. Sahara, 19, 155-158. Kelany, A. In press. 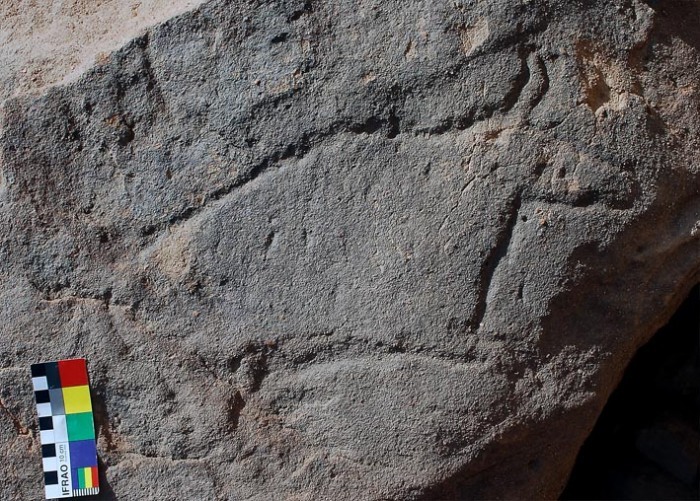 More Late Palaeolithic rock art at Wadi Abu Subeira, Upper Egypt.Annales du Service des Antiquites de l’Egypte. Dirk Huyge, Dimitri A.G. Vandenberghe, Morgan De Dapper, Florias Mees, Wouter Claes and John C. Darnell, 2011. 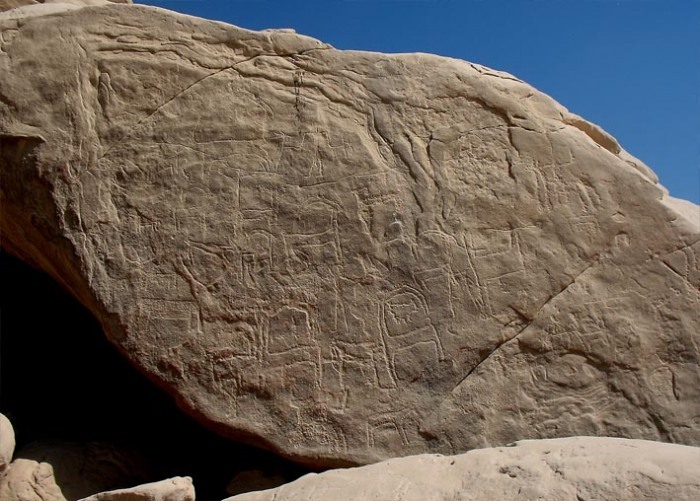 First evidence of Pleistocene rock art in North Africa: securing the age of the Qurta petroglyphs (Egypt) through OSL dating.Antiquity, 85, 330: 1184–1193.